Jared Unzipped: Bluebeard's Wife - A Call For Depicting Women Positively In Literature. 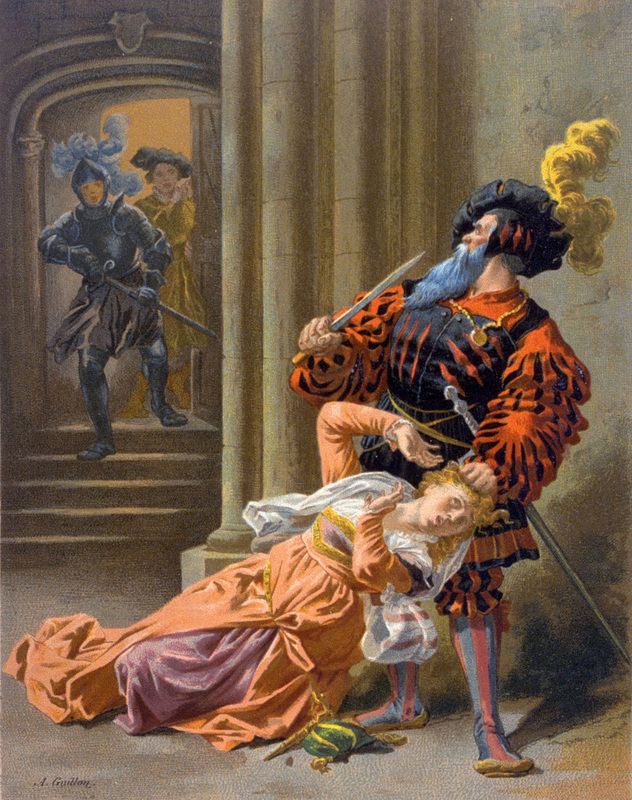 Bluebeard's Wife - A Call For Depicting Women Positively In Literature. In the fairy tale Bluebeard, a young woman marries a wealthy baron surrounded by a cloud of mystery. All of his past wives have vanished, with no explanation from the titular Bluebeard himself as to their whereabouts. At first, the young maiden is disgusted by Bluebeard and his azure facial hair. Though, by spending vast amounts of money upon her and throwing a raucous party, she soon comes around to his offer of marriage. Upon completing their vows, Bluebeard leaves his wife alone in his castle. He explains that he must travel to attend to personal business. 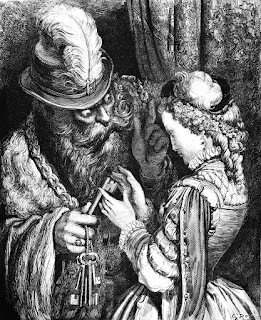 Bluebeard gives his bride a giant ring of keys, which open every room in his castle. Within these rooms are treasures beyond belief. Yet, Bluebeard makes one request of his wife -- there is one specific room she must never open. Of course, curiosity gets the best of the woman and she unlocks the forbidden room with its respective key. To her horror, she finds the bodies of Bluebeard's past wives hidden inside! Their blood has clotted all over the floor and been scattered across the walls. In her moment of shock, the wife drops the key to the room in the dead wives' blood. By some magical means, she is unable to wash the blood off the key. Without explanation, Bluebeard returns home the next day and asks for his keys. Herein, he discovers his wife's transgression and attempts to kill her, thereby adding her corpse to his collection. At the very last moment, the woman's two brothers burst into the castle and slaughter Bluebeard. The murderous villain's wealth passes to his young wife, whom uses the fortune to pay for her brothers' captains' commissions. She also finances a large dowry so that her sister can finally be married. Finally, Bluebeard's widow marries another wealthy man, whom takes care of her for the rest of her life. 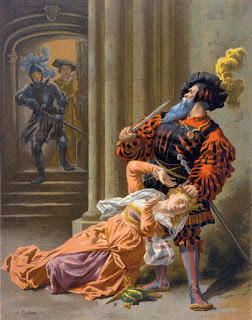 I am both drawn to and disgusted by the tale Bluebeard. Not because I like fairy tales involving dead wives or men with interesting beards, but because this story serves as an important reminder. The entire narrative exists as a means to paint women as untrustworthy, shallow, gold-digging damsels in distress. At no point throughout the story does the wife do anything positive. She at first brushes Bluebeard off because of how he looks. Only after having wealth and excitement lavished upon her does the girl agree to be Bluebeard's wife. Upon inspecting all of Bluebeard's gold, jewels and treasure in the castle, she still has to have more. Her curiosity to open the final room is just too much. She proves to be a jealous snooper with little regard for consequence. Obviously, the wife must be rescued by her two brave brothers; she takes no steps to save herself from a gory fate. In fact, the story is so anti-woman that it doesn't even give the wife a proper name! If there's one thing I've never been ashamed to admit, it's that I'm a colossal proponent of women. They deserve better than to be wilting damsels that are wholly dependent upon men. Nor do they warrant the stereotypical depiction of a meddling, greedy gold-digger; that's completely ridiculous. Bluebeard's wife is perhaps the most hackneyed literary representation of a woman that I've ever read. And yet, that's why the fable of Bluebeard is so important. To understand what women are, you have to comprehend what women aren't. As both an avid reader and a writer, I use Bluebeard's wife much like a barometer of feminism. In reality, women are powerful, independent creatures of magnificence that don't ever need a man to find success and happiness. They deserve to be celebrated in literature, much like Lewis Carroll's Alice or Daniel Defoe's Moll Flanders. A resourceful, self-reliant woman can guide the reader past any obstacle imaginable. Through her leading example, the reader can aspire to become a better person -- woman and man alike.